Toddler bags for out and about: How to get through a restaurant meal with a toddler. Any parent of young children knows that a meal out in a restaurant can be taxing with a toddler in tow. There are ways however to minimise the stress and make it a pleasant experience for everyone. Firstly, train your child at home to sit in their highchair after meals for a period of time with a few toys or activities, or perhaps a book or two and include playpen time (or room time) and mat time in your daily routine. Having these daily periods where your child is used to happily playing with the toys you give them, whilst staying within a boundary, is excellent preparation for other occasions when they will need to sit quietly for a longer than normal stretch of time. Spend a little time preparing some new and interesting activities that are kept aside for use while you are out. Either purchased toys and books or some simple (and cheap) home-made ideas like the ones that follow. Toddler’s generally do not have a well-developed imagination and tire of toys that don’t “do” something relatively quickly, so having to buy new things continually to keep up with their changing developmental needs and interest can become very expensive. These home-made toys are great for developing fine motor skills and hand-eye coordination and when introduced at the right developmental level, will be stimulating and interesting for your young child. If a task is too easy it will not hold their interest. Too hard and they will become frustrated and lose interest. This is the bag of “toys” I put together for my 18 month old to use during a lunch we attended on the weekend. He only used a couple of them as I bought them out one at a time and only changed them over when necessary. Posting bottle: Posting noodles into an empty vanilla bottle and tipping them back out again. 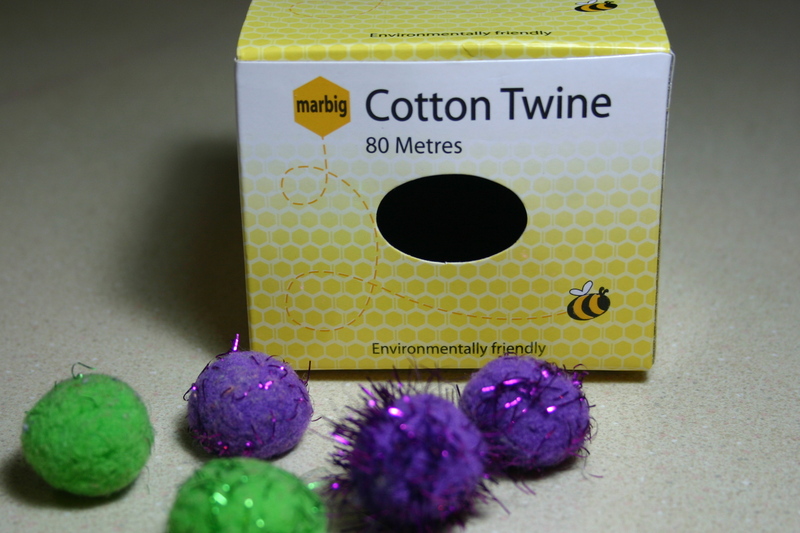 Posting box: Pushing pompoms into the hole in this twine box. Help is needed to open the box to tip them out again but as we are sitting right next to him this is not a problem. Small spaces jar: Posting earbuds into a spice jar with holes in the lid. He discovered after I had taken off the lid and tipped them all back out about 5 times that he could shake them out one at a time through the holes so that added a new dimension to the activity. Posting tin: Posting plastic poker chips through a slot into an empty baking powder container. Yes, I know, it’s another posting activity. But at this age, my son LOVES to post stuff so I’ll run with that for a while and change when he is no longer so fascinated! 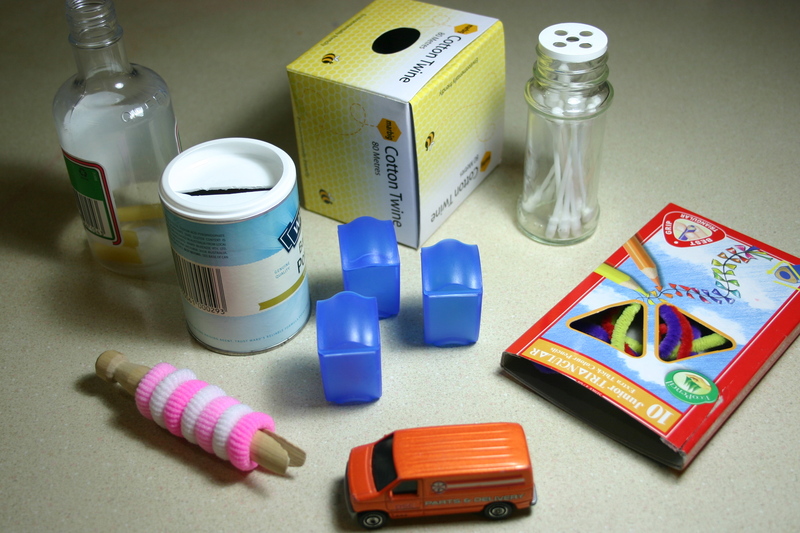 Surprise boxes: Opening and closing these little pill containers to find the small toy inside is great for fine motor development. Dolly peg and hair bands: Sliding hair ties on and off a wooden dolly peg may be a little difficult for him but we will give it a go and see what happens. I haven’t used this one yet. Dinky car: Having older siblings means that interest in cars has developed early and he knows how to play with them form observing his brothers. This old bag is how we cart the activities around. The fact that it has several different compartments as well as zips means that it is an activity in itself. Having children will certainly change your life, but it shouldn’t stop you from doing the things you love. Train your children and you will reap the benefits. This is such a great post Ange, with wonderful pictures. A picture can make all the difference in remembering things when you’re in a rush!